This week we have had some very simple recipes, so that you don’t tell me that I only have very elaborate recipes! The truth is that this type of elaboration is to be thankful because it can get us out of trouble or unexpected visit. And with a very attractive result. 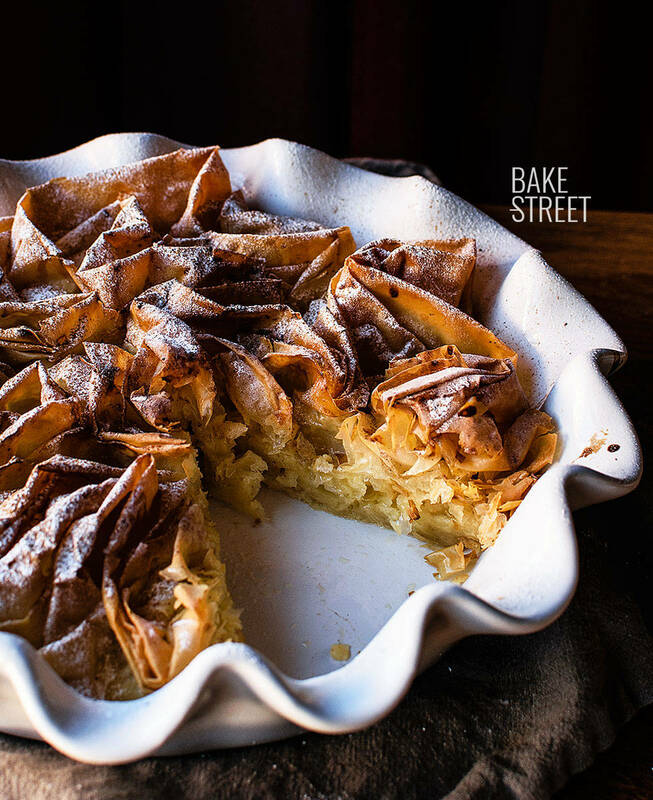 Today we will see how to prepare Galatopita or, more commonly known, Ruffled Milk Pie. Galatopite is a pie of Greek origin whose name means “pie made with milk”. 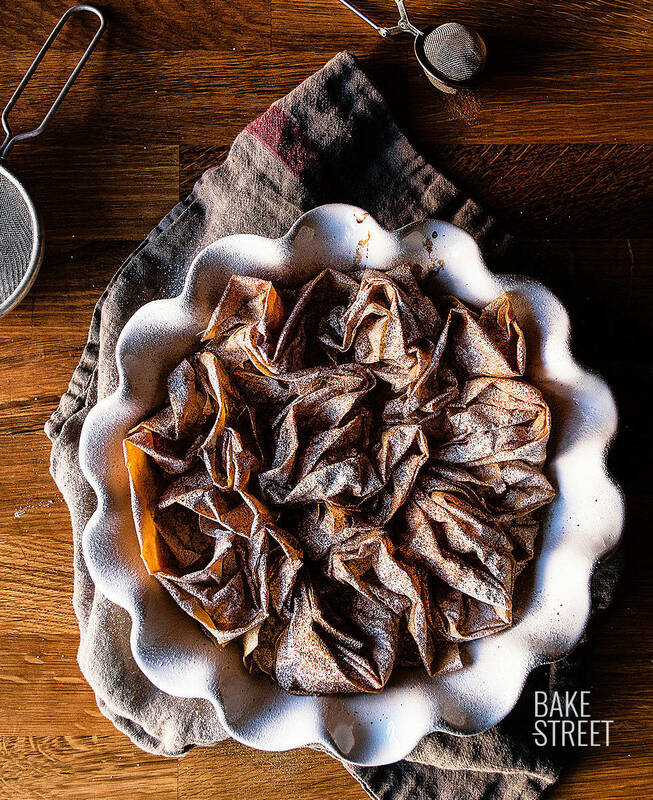 It consists of a curdled base made with milk, eggs and vanilla decorated with phyllo pastry, icing sugar and cinnamon powder. Very basic and simple ingredients that will give rise to an extraordinarily delicious dessert. Creamy and soft at the base with a crisp, aromatic flavor on the surface. 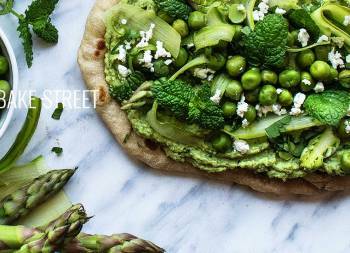 We will have seen this recipe countless times… But it doesn’t stop being attractive! In fact many times, or the great majority of them, we find happiness and pleasure in the simplest things. This dessert could be said to be one of them. To whom do we owe this wonder? 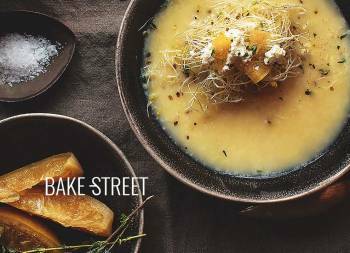 The recipe is from the Greek chef Vefa Alexiadou, whom you may have seen on Martha Stewart’s show. Vefa is a very warm and well-respected woman in Greece. Cook and writer of a book that you should not miss if you like Greek cuisine,”Vefa´s Kitchen“. The result is an absolutely delicious cake… Of that kind you can eat one piece after another without noticing. So be warned! Preheat oven to 355ºF (180ºC). Brush the pan with ghee or melted butter, which you prefer to use. 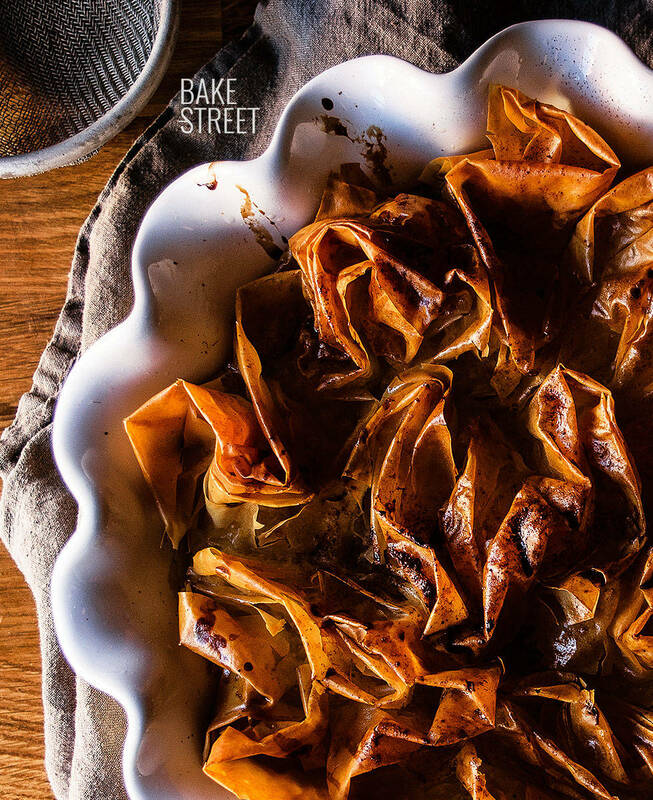 Place a phyllo sheet over a work surface and brush with the butter. 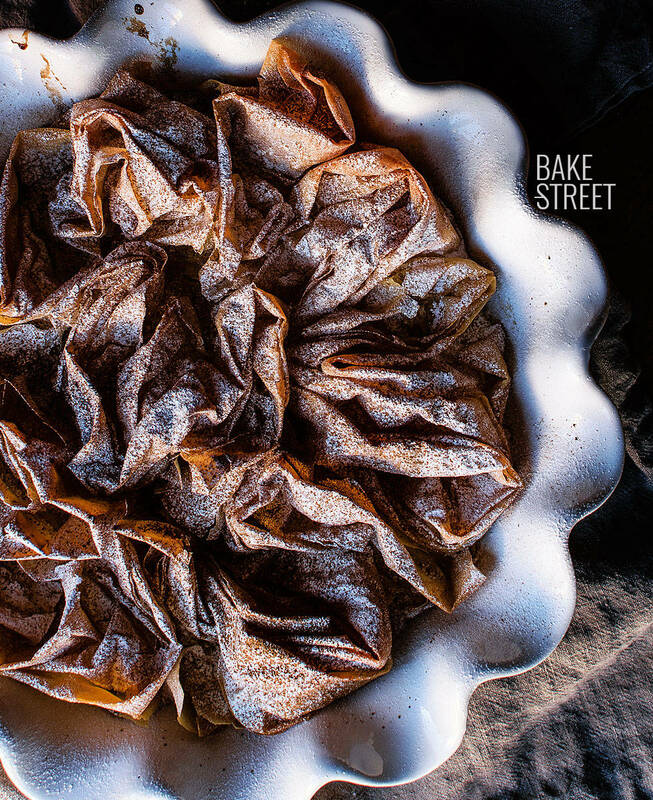 Wrinkle the sheet with care and place inside the pan. Repeat with the rest of sheets. 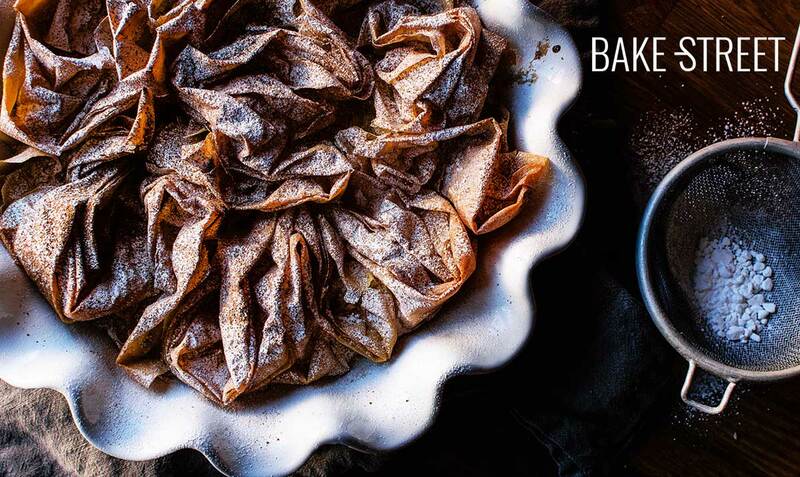 While baking phyllo, prepare the filling. In a medium saucepan pour the milk together with the cream and vanilla. Place over medium heat and leave until it boils. Remove the heat and let it warm. In a bowl, beat the eggs together with the sugar. Pour some of the milk mixture and whisk quickly. We must temper the eggs to prevent them from curdling. Continue pouring the milk mixture little by little at the same time that we beat until it is completely incorporated. Remove the pan from the oven and pour the filling. Remove the pan from the oven using kitchen gloves. Pour the filling over the baked dough. Put it back in the oven and bake for 30 minutes or until the filling has set. Before serving, sprinkle with icing sugar and cinnamon powder. In the video you will see that I add twice as many ingredients, the reason is because I made 2 cakes because we were going to have some friends at home. The ghee or clarified butter has a better taste, its aroma reminds slightly of walnut. But you can use melted butter if you don't want to get too complicated. 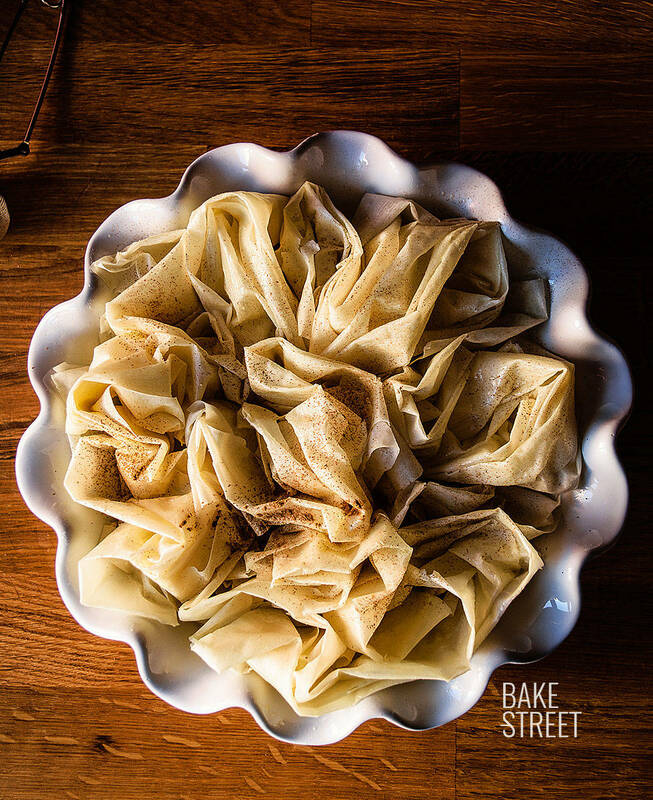 Do not touch the phyllo pastry too much, try to wrinkle it carefully and without pressing it. That way you will achieve a more voluminous and airy appearance. There are versions of this cake that infuse a little cinnamon stick with lemon peel. In my case I preferred to follow the more traditional elaboration, vanilla to infuse the milk, but this second option is also fantastic. Once it has cooled, we can keep it in the refrigerator for 4 days. 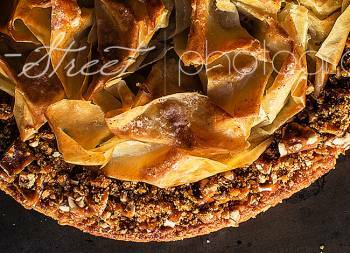 The phyllo pastry will lose its crunchy texture, for that reason I recommend you to prepare it the day you go to consume it. 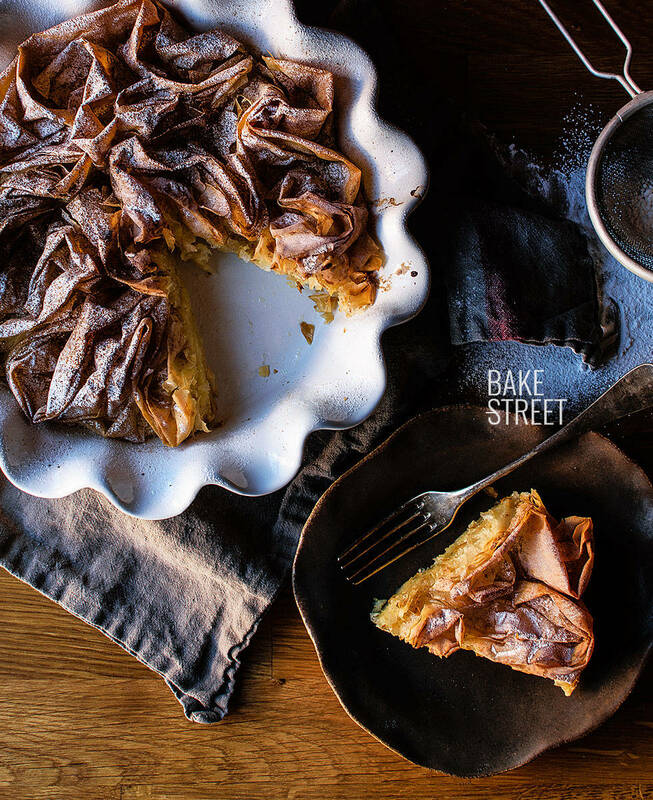 If you had any doubts about what dessert to prepare this weekend, don't forget to keep in mind this milk cake, Galatopita or Ruffled Milk Pie. We will have it ready in just 1 hour and we can have time to enjoy and rest. That weekends are for it. Enjoy and see you on Monday again.